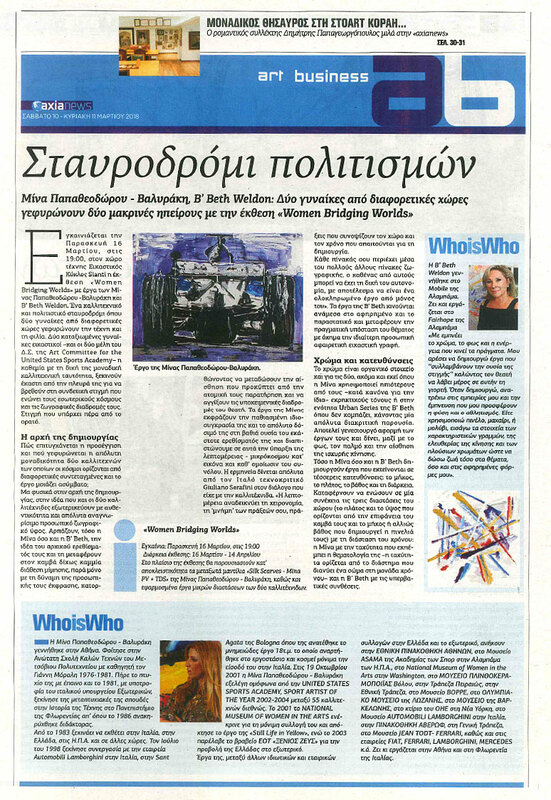 Hosting paintings by Mina Papatheodorou-Valyrakis and B’ Beth Weldon the exhibition “Woman Bridging Worlds” opens at the art gallery Ikastikos Kiklos Sianti on the 16th of March (7pm.) This is an artistic and cultural crossroad with two women from different countries bridging art and friendship. Two accomplished visual artists - both members of the Art Committee Board for the United States Sports Academy, and both with paintings in the American Sport Art Museum and Archives (ASAMA) follow their own artistic routes until they meet each other in that binding instance which entangles their inner worlds and artistic paths. This is a moment transcending visual reality. How could such an approach be possible? How could it be possible to bridge the absolute uniqueness of two artists coming from worlds defined by a totally different set of coordinates and presenting artwork that seems incompatible? Of course, this is founded on the very beginning of the artistic creation, on the initial idea that both artists wish to express in their own genuine way and fully distinctive unique style. Mina as well as B’ Beth catch the initial stimulus and transfer it on the canvas without imitating one another; each one relies on her personal perception and manages to send over the sense that derives from their individual perception and touching the viewer’s inner world. Mina’s work expresses her passionate personality and consuming devotion to the theme’s deeper meaning revealing the absolute likeness of microcosmic details to the whole. Art critic Giuliano Serafini describes it in a unique way during his dialogue with the artist: Detail reveals a gesture, a “memory” of your actions; these actions epitomize the necessary time and space of the creative art. Each painting engulfs a great number of other paintings which could be acknowledged as separate and complete artistic works. B’ Beth’s works linger between abstract and figurative art, bringing out the theme’s true nature through the use of an abstract but also visual style. Colour is an intrinsic element for both artists; even where Mina uses less chromatic intensity from the always -as she admits- explosive tones or in B’ Beth’s Urban Series, a collection where she avoids bragging while keeping a very discrete profile. This is the route of their works. It also provides, along with light and pulse, a sense of powerful motion. Both Mina and B’ Beth create four-dimensional works, including length, width, depth, and duration. They both manage to combine three-dimensional space (the two dimensional canvas and the sense of depth created by their brushstrokes) with time, creating a perfect whole: Mina through her themes’ speed - in the sense of distance an object travels in a given time - and B’ Beth through her transcendental images.